It’s so important from an early age that children develop good oral hygiene habits. Unfortunately, the habits that tend to stick with us are the bad habits, the ones we may not even realize are bad for us. Below are some bad habits that can damage children’s teeth and what parents can do to help change those habits. Chewing ice is one of those habits that kids pick up without even realizing it. Many of the drinks they consume are served with ice, and somehow kids pick up the habit of chewing that ice. The problem is that chewing on ice can chip or crack your teeth. It can also irritate the soft tissue inside a tooth. If your child likes to chew ice, try switching them to sugarless gum instead, or the type of soft, slushy ice is way better than the cubes. Though not as prevalent with so much schoolwork being done on a computer these days, kids just love to chew when they are bored or distracted, and pencils and pens seem to be another handy item for them to chew on. Just like chewing on ice cubes, chewing on these hard objects can crack the enamel of kid’s teeth. Again, try switching them to sugarless gum to appease this habit of chewing on pencils. Kids love sugary snacks (so do adults!). However, too much sugar has been shown to contribute to tooth decay. When you put sugar in your mouth, the bacteria in the plaque will eat up the sweet stuff and turn it into acids. These acids are powerful enough to dissolve the hard enamel that covers your child’s teeth, which is how cavities start. If you’re going to let your kids eat a sweet snack, be sure to have them brush right afterwards to avoid these acids sitting in their mouth for too long. If you are out and about, drinking water is always an option to flush those acids away, but not nearly as good as brushing. This is always a hard one for parents because fruit juice can be healthy. The challenge is that even natural, unsweetened fruit juices have sugars, albeit natural sugars. Fruit juices, tend to be highly acidic, and sometimes just as harmful as soda! These acidic juices, like soda, cause dental erosion and the research has found erosion to affect up to 80% of children. To keep your child’s teeth healthy, stick with natural, unsweetened juices to keep sugar low. The American Academy of Pediatrics recommends to dilute the juice with half water to reduce that sugar and acid even more. Last, if your child consumes juice in a sippy cup, limit the amount of time they have to consume the juice. Juice is recommended to be only given with meals, not between them. If your child is active in sports, especially if they play in any kind of team sport, or any other kind of sport involving high physical activity, it’s critical to consider mouthguards as part of the protective equipment you insist your child wear. So often overlooked, mouthguards can protect your child from trauma that can occur with sudden impact. While not consistently required for children playing sports, mouthguards protect children’s teeth from damage, and parents should be aware of their many benefits. My favorite kind of mouthguards are the SISU – they are inexpensive, comfortable and you can boil and bite them many times. Since most children are growing and losing teeth left and right, these mouthguards I have found to be the best option. www.sisuguard.com. I’d like to think this habit ends in childhood, but many kids and adults alike use their teeth as an opener of packaging, lids, etc. Pediatric dentists see the damage of using your teeth as a package opener all the time; cracked enamel is the common result of using teeth to remove bottle caps. The best way to stop your child from doing that is to lead by example; if they see you opening packages with your teeth, they’ll emulate you and do the same. There are very few candies that are GOOD for a child’s teeth, but sticky, gummy candy is one of the worst. Why? Gooey, gummy, sticky candy sticks to teeth and easily gets trapped between teeth. It can also pull out their fillings. 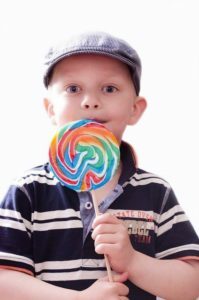 While it may not be realistic to forbid kids from these kinds of treats, be sure they brush after they snack or at the very least, rinse well to try and dislodge the sticky stuff from their teeth. Developing good oral habits in your children is critical! Stopping the bad habits is just as important. Keep your children’s teeth healthy for years to come by stopping these bad habits that can damage children’s teeth.